Afternoon. What a lazy day. I carried the vacuum cleaner upstairs to run it in the stamp room, and something caught my eye and I sat down to stamp. In my defense, I did do laundry in between! This is a stampscape scene. 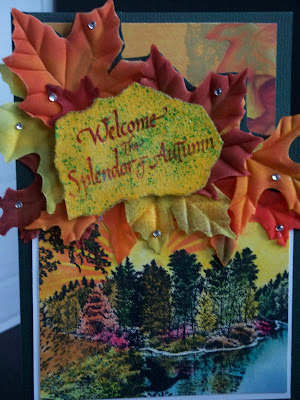 I glued the leaves to the card on an angle, then cut the top of the card away. Beautiful autumn woodland scene with a pristine lake...........what could be more peaceful? Enjoy the view.